C-3PO’s sage advice to R2-D2 in A New Hope served as a terse reminder as to why you should never cross Chewbacca—but The Force Awakens nearly had a scene that would’ve reminded us of this wisdom in a much more brutal fashion, and now you can see a glimpse of it. Revealed through Entertainment Weekly today, and included among others on the upcoming 3D re-release of the film alongside a new commentary track from director J.J. Abrams, the new deleted scene takes place on Takodana, and sees Rey bump into her “old friend” Unkar Plutt in Maz’s bar, just after Finn departs the group. Oh dear. 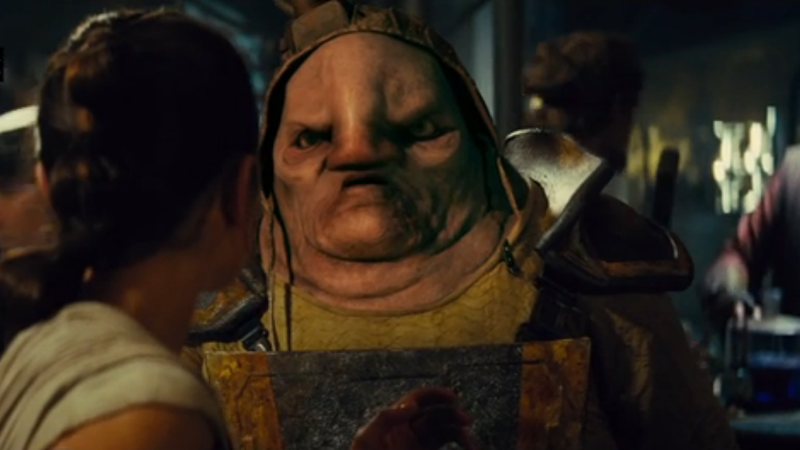 It would’ve been rather graphic, especially from the usually restrained Star Wars movies, to show someone’s arm getting torn off... but it’s hard to deny that Unkar Plutt would have deserved it. One quarter-portion for all those doodads?! What a jerk. The Force Awakens 3D re-release hits shelves November 15th.